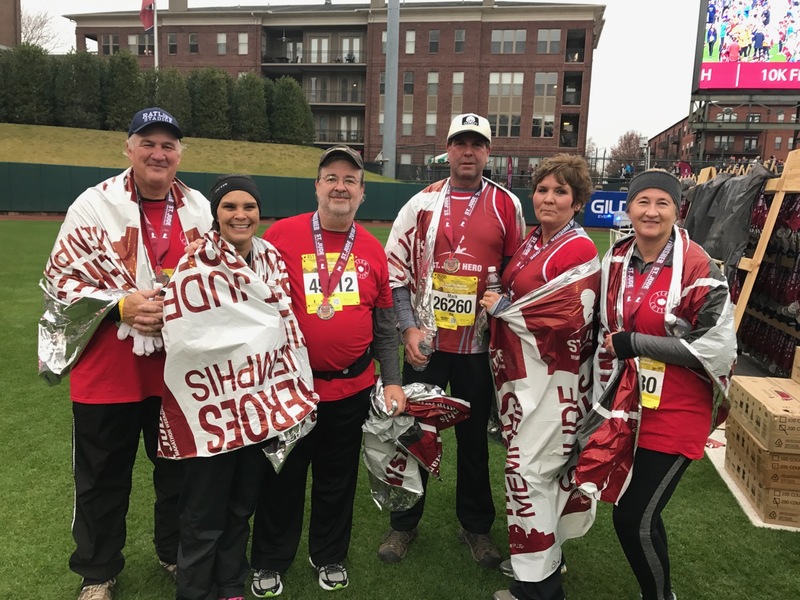 On Saturday, December 3, 2016, Team Cotton participated in the St. Jude Marathon Weekend race events in Memphis, Tennessee. Team Cotton had 25 runners representing The Cotton Board, Cotton Incorporated, USDA, and the National Cotton Council. Team Cotton members traveled from Tennessee, Texas, Arkansas, Mississippi, North Carolina, Virginia and Massachusetts to run for the kids of St. Jude. Most importantly, Team Cotton raised over $7,000 to help St. Jude offer hope to children who are battling cancer. No Cotton Board funds were used for the St. Jude Memphis Marathon Weekend. For more information about donating to St. Jude Children's Research Hospital or participating in the race in 2017, please contact The Cotton Board. Jacey Dupree, from the popular blog Damsel in Dior, is an authority in the fashion and lifestyle space. She also grew up on a cotton farm in Texas. So, it's only natural for Jacey to partner with Cotton Incorporated as a brand ambassador. Cotton Incorporated linked up with the Damsel in Dior for a series of blog posts, videos, and events all promoting cotton and introducing consumers to the way cotton is grown, cared for, and harvested. ” You would be so surprised to learn that there are hundreds of consumers who do not know that cotton is a plant," said Dupree in a recent Cotton Incorporated Q&A blog post. " I want consumers to know that not only is cotton super soft and extremely durable, but by investing in cotton-rich materials you are investing in the future of cotton farming," she said. Watch her video here. 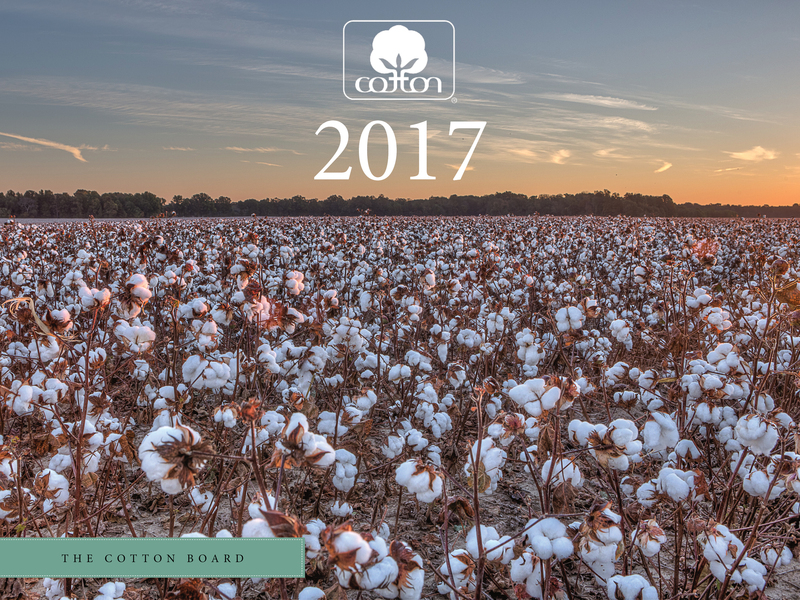 The much-anticipated 2017 Cotton Board Industry Calendars are complete and have shipped. This annual calendar is a great resource for industry meeting dates and information on the Cotton Research and Promotion Program. 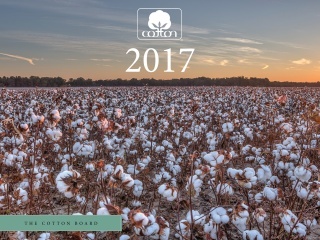 This year, the calendar was sent to over 14,500 individuals in the cotton industry who find it to be an extremely helpful tool for use in their operation or organization. The calendar features images taken by local agricultural photographers and offers updates on many of the exciting projects facilitated or funded by Cotton Incorporated. If you have not received a calendar by the first of the year and would like to, please call the Cotton Board at 901-683-2500 to request a copy. Benchmark prices moved higher in late November and have been flat or marginally lower in December. Values for the most actively traded March NY futures contract increased from levels near 68 cents/lb in early November to levels as high as 73 cents/lb later in the month. In December, prices have been between 70 and 72 cents/lb. The A Index rose from levels near 77 cents/lb in early November to as high as 81 cents/lb near the middle of the month. In December, values have been holding to levels just below 80 cents/lb. In international terms, the China Cotton (CC 3128B) Index rose slowly but steadily over the past month, climbing about 2% from values around 103 cents/lb to those near 105 cents/lb. In domestic terms, the increase was larger in percentage terms (+3.5%, from 15,370 to 15,910 RMB/ton) because of weakening of the RMB against the dollar. Movement in prices for the popular Indian Shankar-6 variety mirrored the pattern for NY futures and the A Index. In international terms, values rose from 72 cents/lb early in November to levels near 75 cents/lb in the middle of the month before easing more recently and falling back to 73 cents/lb. In local terms, prices traded between 37,700 and 39,900 INR/candy. Pakistani spot prices increased from 69 to 73 cents/lb over the past month. In domestic terms, prices rose from 5,900 to 6,250 PKR/maund. Pakistani spot prices followed the same general pattern as NY futures and the A Index, but the magnitude was muted. In international terms, values shifted between 68 and 70 cents/lb. The largest revisions in this month's USDA report were related to production. The figure for the global cotton harvest was lifted about one million bales, from 103.3 to 104.2 million. At the country-level, the biggest changes were for Australia (+500,000 bales, from 4.0 to 4.5 million) and the U.S. (+362,000 bales, from 16.2 to 16.5 million). For mill-use, there was only a marginal change at the world-level (+95,000 bales, from 112.0 million to 111.9 million), but the stability of the global figure was a result of multiple offsetting changes for usage estimates for individual countries. Countries with notable increases included China (+250,000, from 35.5 to 35.8 million) and Vietnam (+200,000 bales, from 4.7 to 4.9 million). Countries with notable decreases included India (-250,000, from 24.0 to 23.8 million), the U.S. (-200,000 bales, from 3.5 to 3.3 million), and South Korea (-100,000, from 1.3 to 1.2 million). Trade projections were lifted 95,000 bales (from 35.2 to 35.3 million). In terms of imports, changes of significance were for South Korea (-125,000 bales, from 1.3 to 1.2 million) and Vietnam (+200,000 bales, from 4.8 to 5.0 million). In terms of exports, the largest revisions were for Australia (+200,000 bales, from 3.9 to 4.1 million), the U.S. (+200,000 bales, from 12.0 to 12.2 million), and the African Franc Zone (-150,000 bales, from 4.7 to 4.6 million). The forecast for world ending stocks increased 842,000 bales, rising from 88.3 to 89.1 million. The bulk of the global addition was a result of projections for larger gains in exporter stocks, with figures growing for the U.S. (+300,000 bales, from 4.5 to 4.8 million), India (+250,000 bales, from 11.5 to 11.8 million), Australia (+300,000, from 1.8 to 2.1 million), and the African Franc Zone (+180,000 bales, from 1.5 to 1.6 million). As the crop year progresses, the buildup of stocks in exporting countries could emerge as a factor putting downward pressure on prices as exporters compete for market share. Other factors that could also be expected to weigh on prices include the strength of the U.S. dollar and an emergent outlook for the upcoming 2017/18 season that indicates there will be a meaningful increase in planted acreage. As part of its long-term forecasting project, the USDA recently released a preliminary forecast for 2017/18 that puts U.S. upland plantings at 10.5 million acres (+5% or +500,000 acres). Higher prices for cotton relative to those for crops that can compete for cotton acreage, like corn and soybeans, could be expected to motivate increases in acreage in other major producing countries. In turn, this should result in further accumulation of exportable stocks next crop year. While the fundamentals suggest cotton prices could eventually turn lower, there are several factors that have supported prices recently. One of these has been the set of complications surrounding the Indian government's effort to make more of its economy traceable. The defining reform related to this effort was the elimination of the most commonly used currency notes. Since many of the transactions that move cotton from Indian farms to gins/merchants/mills are based on cash, these reforms have been disruptive to the process of preparing Indian fiber for shipment. As a result, there has been less Indian cotton available to weigh on the market. Direct interaction between the Chinese market and the rest of the world is limited because of import quotas, but the upward trend in Chinese prices may have had some influence on external prices. Part of the strength in Chinese cotton prices over the past couple months can be attributed to issues related to the accessibility of the harvest. With 78% of Chinese production in Xinjiang province and the vast majority of Chinese mills in eastern provinces, transport is an important variable. Railcar space has been limited, costs for transport by truck have been significantly more expensive than last year, and adverse weather has caused bottlenecks. Reports indicate that transport problems are abating, and this may help Chinese prices ease. The Chinese government released a statement regarding the next round of sales from reserves and the promise of additional supply could also push Chinese prices lower. Sales will recommence March 6. The daily volume is set at 30,000 tons (138,000 bales) and auctions are scheduled through the end of August. However, the daily volume can be increased and the time period extended if demand is strong. Prices will be determined by the same process as the last release, with each week's base value derived as a 50/50 average of domestic and international prices (A Index) from the previous week.